Christoph Schissler made compendia in many different formats; this rectangular version is one of the more sober styles. 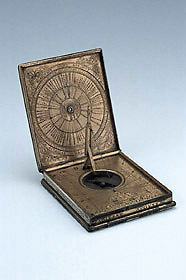 It carries two horizontal sundials, one with a string gnomon and the other with a pin. As on other string gnomon dials by Schissler (Epact 57238), the material actually used to cast the shadow was catgut. Wound round a spring barrel to keep it taut, this gnomon was held above the dial plate by an ingenious folding support. Also included are such standard elements as a compass, lunar volvelle and a wind rose. Less common is the inclusion of a table to display the directions of European cities relative to Augsburg.